Donald Trump has dismissed North Korea's claim to be developing missiles capable of striking America. 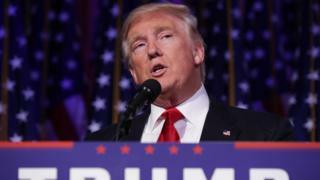 In a tweet, the US president-elect derided the claim by North Korea's Kim Jong-un that preparations were in the final stage, saying: "It won't happen." It was not clear if Mr Trump was expressing doubts about Pyongyang's nuclear capabilities or was planning preventative action. Mr Trump also berated China for failing to help rein in its ally North Korea. "China has been taking out massive amounts of money & wealth from the U.S. in totally one-sided trade, but won't help with North Korea. Nice!" Mr Trump tweeted. How might Trump deal with Kim Jong-un? "We would not agree with that assessment," US State Department spokesman John Kirby told reporters at a regular briefing on Tuesday. A spokesman for China's foreign affairs ministry said Beijing's efforts on Korean peninsula denuclearisation were "perfectly obvious". China had "proactively participated" in UN discussions and jointly passed several resolutions, the spokesman pointed out. In a televised New Year message on Sunday, Mr Kim said North Korea was close to testing long-range missiles capable of carrying nuclear warheads. He said the country was now a "military power of the East that cannot be touched by even the strongest enemy". North Korea has conducted two nuclear tests over the last year, raising fears that it has made significant nuclear advances. But it has never successfully test-fired long-range missiles capable of carrying nuclear warheads. Experts estimate it might take less than five years. UN resolutions call for an end to the country's nuclear and missile tests. There are no ifs or buts in Mr Trump's tweet - simply the words: "It won't happen". They may mean that Mr Trump believes North Korea will fail to make the technological progress, or that the regime will collapse, or that he could persuade Kim Jong-un to renounce his nuclear programme - he said before the election that the two leaders might sit down over a burger. Or it could be that Mr Trump is considering military action. If so, experts believe the options are limited. One told the BBC that neither "bunker-busting" bombs nor a special forces operation would be certain to destroy the programme. The most likely counter-measures would be infecting computers with disruptive viruses, and perhaps the assassination of key scientists, something difficult to do for many reasons. Prof Siegfried Hecker of Stanford University in California told the BBC in September that North Korea's ability to field a missile fitted with a nuclear warhead capable of reaching the US "is still a long way off - perhaps five to 10 years". Mr Kirby at the US State Department indicated that the US agrees saying that although North Korea's leader "continues to pursue both nuclear and ballistic missile technologies... We do not believe that at this point in time he has the capability to tip one of these with a nuclear warhead." North Korea claims to have developed heat-tolerant materials that would allow long-range missiles to re-enter the atmosphere, but many Western experts have cast doubt on this. Prof Hecker also worries that North Korea's technological ability increases the likelihood of the spread of nuclear weapons to "non-state actors" or "terrorists".